Update July 2015: It took several months – but – my speed levels returned. I eventually filed a complaint with the FCC over it, and throughout the months I kept in touch with my appointed contact and she gave me credit each month for my service. Comcast recently upgraded equipment in Atlanta and rolled out significantly faster speeds, so I’m sure the situation wasn’t resolved from my doing in as much as it was infrastructure upgrades. Still, getting a full credit each month during the slowdown for near non-usage helped. If you are suffering slow speeds, I suggest filing a complaint with the FCC as I did. The FCC requires that Comcast address each complaint and monitors them randomly. At worst, you may get a full or partial credit for the lack of speed. 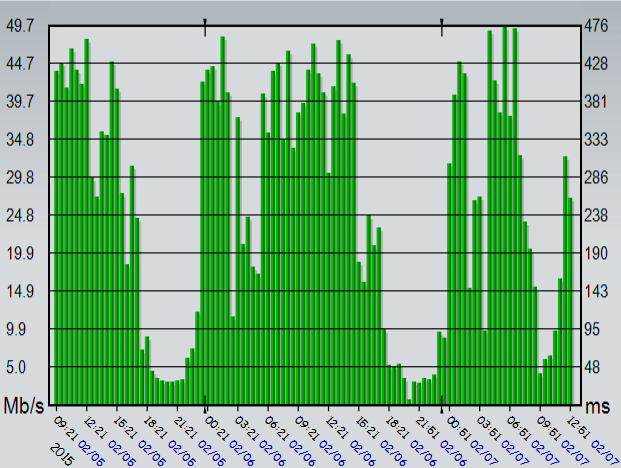 That’s a recent chart of my upload and download speed from Comcast. I started noticing that at night, speeds were sluggish with my Internet. I ran a quick speed test, and as expected it came back quite slow – less than 2.5Mbps slow. What was going on? After all this, the speeds simply were not affected. The support person gave up and said that a tech would need to come out to resolve it, and would be present 1/27/2015. Sure, whatever to get my speeds I’m paying for back. Whilst working from home and waiting for Comcast support, I noticed that my Internet speeds had returned. Did something magically happen? Did the configuration finally take with my modem? That’s when it hit me. That was the only explanation – nothing had changed on my network. The only variable was time. When I tested my modem at night, I got maybe 2.5Mbps. During the daytime, my glorious 50Mbps speeds were back. So, I waited for the Comcast tech to arrive. When the tech shows up, I start to talk to him. “I think I know what the issue is”, I say. “Oh yeah, what is it?” he says. “You got it…” he says. He then shows me an email that says that says my Internet runs out of a certain “block” in Comcast. Not just mine, but 100 of them are oversold. I asked how big these “blocks” were. He said that they cover a very large and populous areas. So a “very large and populous area” x 100, was being affected. “Do you know if there are plans to add capacity to it?” I asked. “I’m sure they will, but there’s no ETA I can give you” he replied. It wouldn’t do any good to criticize him, when the issue is known and it is further away, in both network topology and corporate structure. Trying to build my case up, I found an amazing program, Auto speed tester by JackDinn, which allows you to “automate” your speed testing. So after installing it, and letting it run in the background, that’s when the picture really became clear. There was a 96% reduction in speed from peak (nights) to non-peak (weekday daytime). So, being a lone person won’t help. That’s where I want to rally the Internet to help. Let’s fight this travesty of billing and bandwidth with data and science. Blog about your speeds, link to other stories, and promote #MyComcastSpeed. Together we can raise awareness, get press, and let Comcast know we’re frustrated with not getting what we pay for.